Testing of the new vehicle is already underway around the world with the first development mules and prototypes reaching North American shores earlier this month. Testing on the continent provides valuable data to engineers given the wide variety of terrain and surfaces available in America. 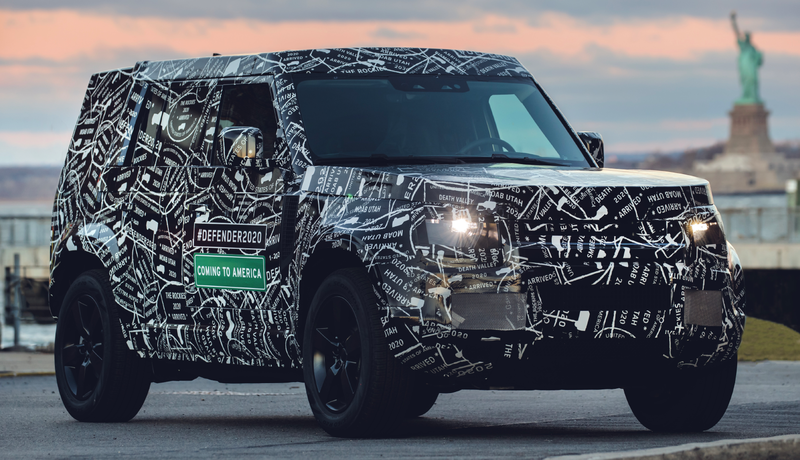 Engineers will subject the vehicle to rigorous test extremes to make sure the new Defender is the most off-road capable Land Rover vehicle ever; operating in temperatures from -40°F to +120°F while driving the test vehicles on- and off-road at altitudes of more than 13,000 feet above sea level. The Series Land Rover vehicles haven’t changed much since the idea for the first model was dreamed up shortly after World War II by the Wilks brothers on the shores of Red Wharf Bay, Wales, more than 70 years ago. With each successive design — from the Series 1, 2 and 3 Land Rover vehicles, to the later “Defender” branded vehicles — changes were largely evolutionary, rather than revolutionary. Even the design of the previous generation Defender remained largely unchanged for the 33 years it was produced. Instantly recognizable by its rugged squared-off exterior, round headlights and signature rear-mounted spare tire, the Defender and all Series Land Rover vehicles have been lauded the world over; driven by farmers, military and police, celebrities and even royalty. By one measure, it’s estimated that a Series Land Rover was the first automobile many of the world’s population ever saw in person. All will be revealed in 2019. Register your interest and receive updates on the new Defender.